Getting the new Maya Cycle bike trailer put together was easy enough. All I had to do was remove it from the box, mount the rear wheel, rear fender, and rear reflector, pump a little air into the tire, and position the safety flag in place. Piece of cake! Attaching the trailer to my bicycle, however, was a bit more difficult. I read and re-read the included instructions, and still couldn’t figure out how to attach the trailer to my bike. Luckily, I was able to find a video on YouTube that had been produced by the company, and it showed how the installation process was meant to be done. Only after watching this video was I able to figure out the problem. The trick is, there’s a special axle that comes with the Maya Cycle trailer and you need to replace your bicycle’s existing rear axle with this new one. Once you’ve done that, you have to mount both ends of your new rear axle with two steel washers, an axle bracket and a locking wing nut. Finally, you need to remove the fork from the trailer by lifting it out of the trailer’s pivot tube. Then loosen the wing nuts on each end of your bicycle’s rear axle and position the trailer fork so each of the fork dropouts sits between the inside washer and the axle bracket. Rotate the axle bracket so it presses firmly against the axle, and then tighten everything in place with the wingnuts. Getting the trailer fork attached to the trailer again takes some practice. The company makes it look easy, but I struggled with it the first few times around. After getting the trailer attached to my bicycle, I quickly realized that the trailer fork was dangerously close to the bottom of my bicycle’s rear rack. If I were to hit even the smallest bump with the trailer in tow, this overlap could cause some serious damage to my bicycle. I solved this problem by simply removing my bike’s rear rack, but I’m sure some people might want to travel with both a trailer and a rear set of panniers on their bicycle, so this issue is a definite drawback. Yes, getting the Maya Cycle trailer attached to your bicycle does take some practice, but once the trailer is in place, it’s a total joy to ride with. The rear wheel wobbles back and forth a bit, but on flat terrain, you really don’t hear or feel the trailer behind your bike at all. The ride is incredibly smooth! Only when climbing a hill of any kind, or rounding a tight corner, do you feel the trailer’s weight behind you. Backing up takes some practice and corning works great, as long as the corner you’re trying to turn isn’t too sharp. When you’re ready to pull to a stop, there’s no need to lean your bike up against some nearby object. Instead, simply kick out the Maya Cycle’s built-in kickstand and your bike will balance in place quite beautifully – allowing you to load and unload the trailer with whatever it is you wish to carry with you on your travels. When you want to remove the trailer from your bike, there’s no need to remove the rear axle. Simply leave the axle that comes with the Maya Cycle trailer in place on the back of your bicycle and remove the trailer by simply loosening the wing nuts on each side of the axle. The trailer fork will pop out of place, and you are then free to ride your bike as you would normally. The only trick here is that you have to remove the washers and axle brackets on each side of the axle and store them in a safe place for the next time you use the trailer. If you try and leave the washers and axle bracket in place, they will rattle around and create all sorts of noise while you’re using your bicycle. 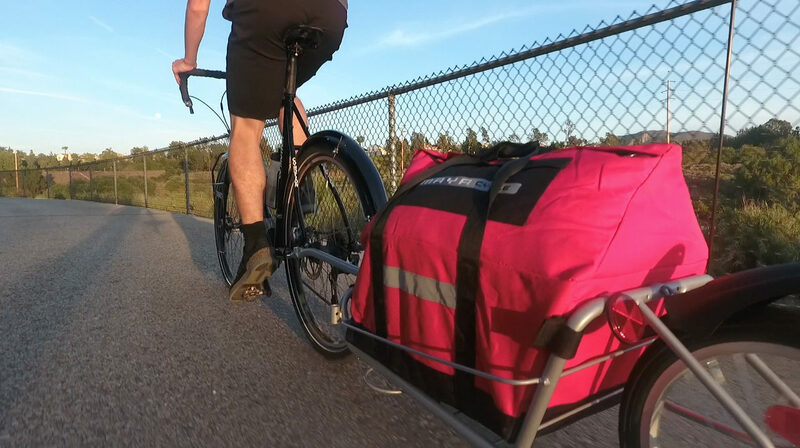 The Maya Cycle trailer can be purchased with or without the red cargo bag you see featured in this video. Removing the bag allows your to haul firewood, small pieces of furniture, and other bulky objects. Using the cargo bag, however, is perfect for local commuting and long-distance bicycle touring – when you might need to carry camping equipment, food, clothing, toiletries, and a whole host of additional items. Overall, I’d give the Maya Cycle trailer an 8 out of 10. It’s not the most well-built bicycle trailer on the market (I think the BOB trailers are higher in overall quality/durability), but the Maya Cycle bike trailer is affordable, it looks good, it works well as a one-wheel bike trailer, and it’s perfectly built for people who plan to use it on road-based bike tours and trips around their neighborhood. I love the built in kickstand and the red cargo bag is a nice added touch. 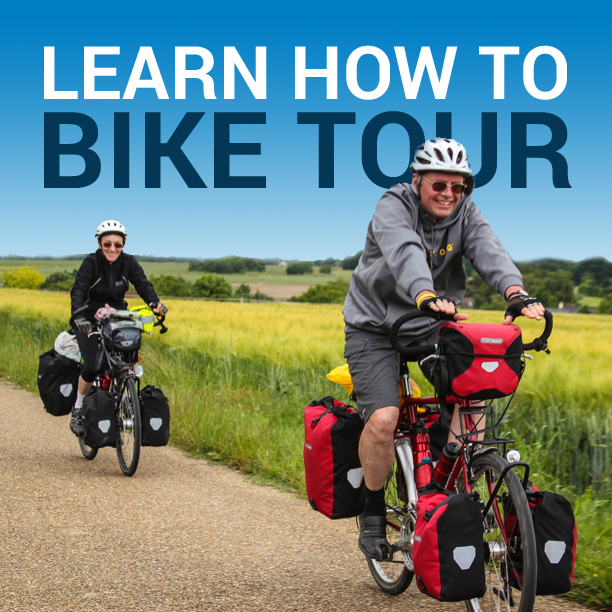 For only $250 USD, it’s a really good deal – especially when you compare it with some of the other one-wheeled bike trailers currently on the market. This entry was posted in Bicycle Touring Pro Articles, Featured Articles, Main Articles, Product & Service Reviews, Products, Trailers, Videos and tagged 1 wheel bike trailer, best bike trails, bicycle trailer reviews, bike trailer, featured, maya bicycle trailer, maya bike trailer, maya cycle, maya cycle bike trailer review, maya cycle review, one wheeled bike trailer, video, video review. This trailer is available for $250. The Bob Yak Plus is available online for $300. I don’t see a reason not to go for the Bob for only an extra $50.